At the college’s 140th commencement, approximately 350 current students will receive diplomas. But undergraduates won’t be the only ones receiving degrees. At the ceremony, President Chopp will present honorary degrees to three others: entrepreneur and humanitarian, Tralance Addy, novelist and social activist Lorene Cary and U.S. diplomat and former World Bank president Robert Zoellick. Nancy Nicely, the secretary of the College and vice president for communications, elaborated on the significance of receiving an honorary degree from the college. “The honorees are meant to deliver inspirational talks to the graduating seniors, and their remarks are often very uplifting. These are individuals who quite often have reached the pinnacle of their careers, or are on their way to doing so,” she said. Since awarding its first honorary degree in 1888, the college has had a long tradition of celebrating influential and groundbreaking educators, artists, thinkers and activists. Notable degree winners include theoretical physicist Albert Einstein, poet and essayist W.H. Auden, former president Lyndon B. Johnson and author and Swarthmore alumnus Jonathan Franzen. Maurice Eldridge, the vice president for community and college relations, explained that various members of the college community as well as alumni were invited to nominate candidates, but that seniors were specifically included in the invitation to do so. Criteria for an honorary degree include distinction, leadership, originality in significant human endeavor, and an ability to speak well for a commencement speech. 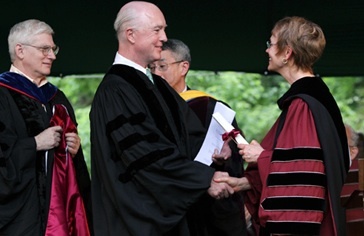 Although one does not need to be a Swarthmore graduate in order to receive a nomination, preference is given to individuals who either attended the college or have an existing affiliation with it. Each of the 2013 honorary degree honorees has attempted to aid a specific community or group of people in a remarkable, lasting manner. Lorene Cary is not a Swarthmore graduate herself, but is a known activist, teacher and author, currently located in Philadelphia. Her first book and personal reflection, “Black Ice,” was chosen as a Notable Book for 1992 by the American Library Association and her first novel, “Price of a Child,” was chosen as the inaugural “One Book, One Philadelphia” selection by the City and its Free Library in 2003. In 1998 Cary founded the Art Sanctuary, an African-American based art and literature program and institute. Art Sanctuary hosts an African American arts festival where writers and students participate in panels, teachers’ symposiums and other events. Through art, culture and literature, Cary has attempted to strengthen community bonds in Philadelphia. The other two candidates, however, carry with them a bit more controversy. Whether or not CEOs, businessmen, and Wall Street types are appropriate role models and commencement speakers for the college is a topic of debate. Addy is a businessman, but he has sought to bring change and aid to communities worldwide. He is currently the first director of the Stanford Institute for Innovation in Developing Economies (SEED). Created at Stanford University, the institute aids in furthering, growing, and fostering entrepreneurship to help build successful enterprises that can change the lives of many who live in poverty. Addy also became CEO of WaterHealth International (WHI), building a network of local professionals and NGOs to operate safe water areas as well as educating many communities about the importance of clean water. The organization has since established water purification systems in Ghana, Tibet, Mexico, El Salvador, Bangladesh, and Haiti. Addy also served on the Swarthmore’s Board of Managers from 2003–2007. The decision to award Zoellick an honorary degree is perhaps the most debated. A Swarthmore graduate and former cross country runner at the college, Zoellick has worked at Fannie Mae and as a senior international advisor at Goldman Sachs. He served as a foreign policy advisor to George W. Bush during the 2000 election campaign, and was named Bush’s trade representative in the former president’s second term. Notably though, he “is credited with leading flexible, effective, and innovative responses to assist the World Bank’s developing-country clients during the food, fuel, and financial crises that arose during his tenure,” according to the Swarthmore College website. Zoellick also sought to aid in increasing the voices of many third world nations in the Bank’s governance and staffing. In addition, he spearheaded programs, leading to new initiatives that could, and have furthered global humanitarian development work, and increased social responsibility. Zoellick also served as President of the World Bank Group from 2007 until 2012. Some however, believe that Zoellick might not be the best choice for a commencement speaker. Tyler Welsh ’16 expressed some reservations and echoed sentiments similar to those of Baryenbruch. Stephen Golub, an economics professor at the college, defended the Zoellick decision. Despite the divided opinions on the subject, commencement weekend takes place between May 31 and June 2, at which time all three of these honorees will speak to members of the senior class as they prepare to officially graduate and leave the college.